GH3C-290 | Size: 50 ml / 1.69 fl.oz. Especially designed to prevent and ameliorate the skin care challenges posed by perimenopause and menopause. Has an ultra-hydrating, rich texture which creates a powerful barrier to lock moisture into the skin. Stimulates the skin's natural collagen, elastin and skin protein production, thus improving overall elasticity for a firmer, tighter, more toned look. Reduces the depth of fine lines and wrinkles, firms and redensifies sagging skin, brightens and unifies tone, minimizing and preventing all signs of aging or hormonally imbalanced complexions. Natural oils, waxes and fats, with high reconstructive power for the skin help maintaining a youthful appearance. The patented Anti-Aging Complex, Hyaluronic Acid + Vitamin E + Juvinity™, provides antioxidant protection against free-radical damage, revigorates the cellular metabolism, restores skin’s appearance into a fresher, younger-looking. 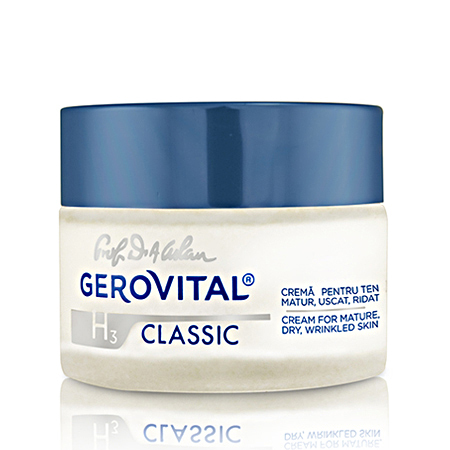 Gerovital H3 Prof. Dr. Ana Aslan is the first anti-aging trademark in the world! INGREDIENTS: AQUA, PARAFFINUM LIQUIDUM, LANOLIN, PETROLATUM, SORBITAN OLEATE, CERA ALBA, GLYCERIN, HYDROGENATED CASTOR OIL, BUTYROSPERMUM PARKII BUTTER, TOCOPHERYL ACETATE, PARFUM, PHENOXYETHANOL, MAGNESIUM SULFATE, STEARIC ACD, CAPRYLIC / CAPRIC TRIGLYCERIDE, BHA, TETRASODIUM EDTA, DECYLENE GLYCOL, CAPRYLYL GLYCOL, SODIUM HYALURONATE, GERANYLGERANYLISOPROPANOL, SODIUM HYDROXIDE. I have been using this for a long time as it helps my dry skin a lot especially during winter. I highly recommend this skin cream. i have been using this moisturizer now for nearly two years and i swear by it. There is a visible difference - a lessening of the lines around my mouth and eyes and a more toned look of my cheeks, chin and neck. Massaging it into my skin helps stimulate as well.rnI recommend it highly.